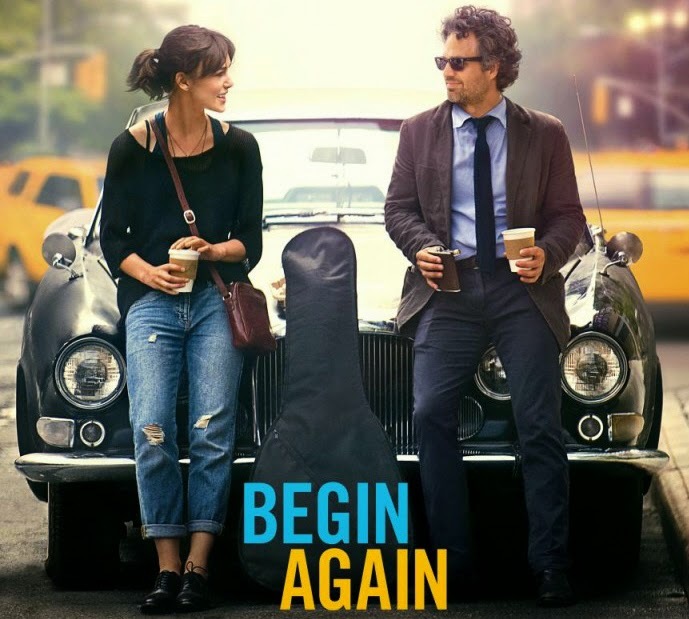 John Carney, director of Indie sensation Once, tries to duplicate the magic of music in his latest film Begin Again. The film premiered at the Toronto Film Festival a year ago under the title Can a Song Save Your Life?. The film shares many similarities to the film Once including: a man and woman make music together, the music is a powerful force, and their love and connection to the city. Begin Again tells the story of a songstress, Gretta (Keira Knightley) and her writing partner and boyfriend Dave (Adam Levine) as they move to New York City after Dave has been signed by a major record label. Dave climbs to success on Gretta’s songs, cheats on her, subsequently dumps her, and becomes an overnight musical sensation. Gretta leaves their aparment with her bike and a suitcase to find her street musician friend Steve (James Corden) so that she may stay at his apartment until she can get out of the city and home to London. Of course, Steve can’t let Gretta leave the city without accompanying him to a performance at a bar that same night. She goes with him to the show where he makes her get onstage and play a song. A recently fired, and drunk, record executive, Dan Mulligan (Mark Ruffalo), sees her perform and is in awe of her raw talent. He approaches her after the show, convinces her she is amazingly talented and for the remainder of the movie they make a CD in various locations around the city to convince his old record label that she deserves a record deal. Throughout the process they highlight various things around the city, convince talented musicians to play for free, enlist the help of CeeLo Green (who is playing a hip hop/pop star in the movie), outrun the cops, and eventually make a full CD that the record label finds worthy of a deal. While the movie is mostly filled with cliché and often unbelievable plot points, the movie goes for a sincere approach to music and relationships. Mark Ruffalo played his character with an obvious passion which would have been nice to see in all of the characters. There were also many funny moments specifically from James Corden and Mark Ruffalo’s characters. The sincere approach to life and music of the film made it’s cliched story more realistic and enjoyable in the way that jokes were able to land and the story didn’t center on the main characters falling in love and living happily ever after. The film is very watchable and you’ll find yourself laughing out loud more than once in the theater, but it probably won’t make you believe that music is a magical force that will one day change your life forever. I admire any actor willing to learn how to sing or play an instrument for a part. It’s no easy feat and Keira Knightley does it justice. While she doesn’t have a big booming voice, the tone of it is perfect for this kind of music.